RUN THE ALAMO:2018 ALAMO 26.2 Marathon, ALAMO 13.1 HALF and The Krispy Kreme Doughnut Dash 6.2 & 3.1, THE Original Home Grown, Down Home, Spring Time 1/2 Marathon, 10k & 5k in San Antonio. 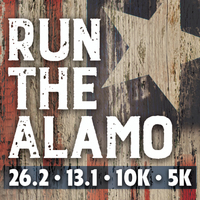 Your day will start with a multiple musket volley at the historic cradle of liberty, The Alamo, as you pulsate past some of San Antonio’s best cultural icons on your way back to The Alamo and an amazing post race party. ***BAG CHECK*** We will have bag check for our runners starting at 5:15am. Please make sure your bag is marked with your bib#. Bag Check location TBD. We are excited to treat you to another EPIC Certified Course for what we believe to be one of the most scenic running courses around including ALL 5 World Class Missions for our Alamo 26.2 Marathoners. Our historic course takes in THE best that San Antonio has to offer; showcasing the cultural icons that reflect the wonder, charm and history of our glorious city & heritage. Course Time Limits: You will have plenty of time to complete the course with a 4 HOUR TIME LIMIT for THE ALAMO 13.1 HALF and 7 HOURS for The ALAMO 26.2 MARATHON. We’ll have plenty of Aid Stations every 1 – 1.5 miles stocked with plenty of water & NUUN to replenish you. This race offers a tracker app so your family and friends can know where you are on the course. RELAY folks enjoy The RUN THE ALAMO Start. Each runner in the relay will run 6.55 miles. Saturday, March 2nd – Venue Villita – 11AM-6PM - San Antonio, TX. If you are picking up a packet for a friend or family member, you must have them SIGN THIS WAIVER and bring it with you in order to receive their packet.